I’ve been gaming the same driver for about three years. It’s not that I’ve had different drivers to use, it’s that nothing I’ve tried was good enough for my swing/game to dethrone that gamer. That is until this spring. 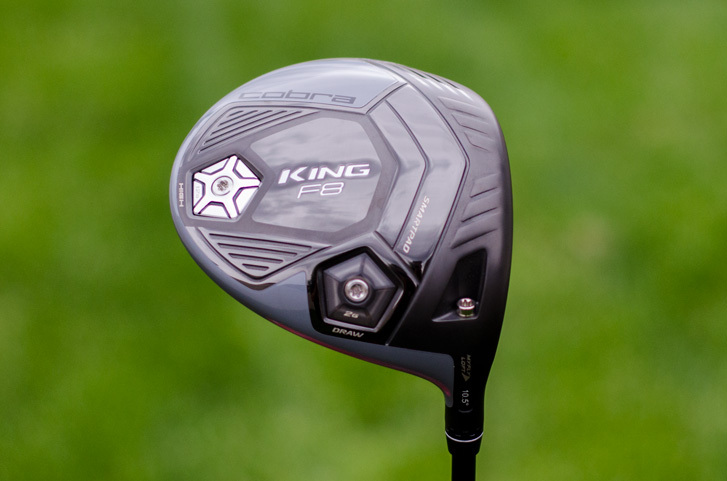 The current driver spot in my starting lineup is the Cobra King F8 adjustable driver with Cobra Connect tracking technology and an extremely interesting milled face. Let’s take a look. 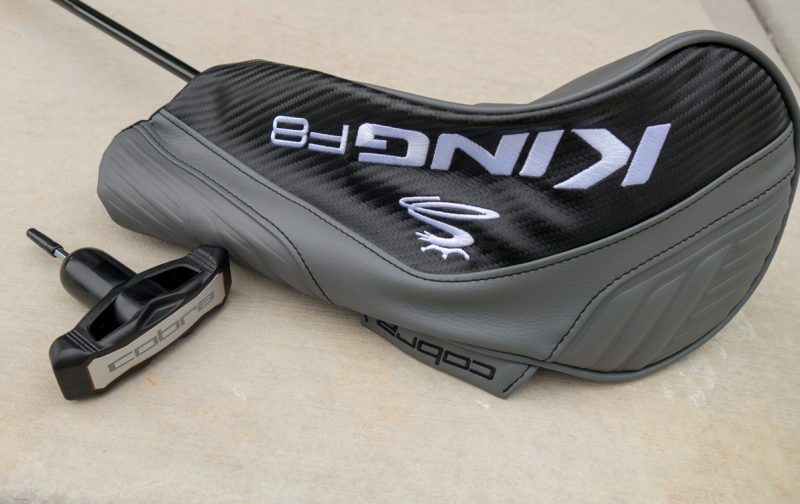 The Cobra Golf F8 driver comes in two flavors, the F8 and F8+. The F8 is the more “forgiving” version with a slightly different moveable weight setup and adjustable hosel. The F8+ is more of a “player’s” club, meaning it is a little less forgiving but more “workable.” By workable I mean the ability to curve and control the trajectory of shots. Due to the state of my game for the last couple of years, I thought it wise to go with the “forgiving” model. 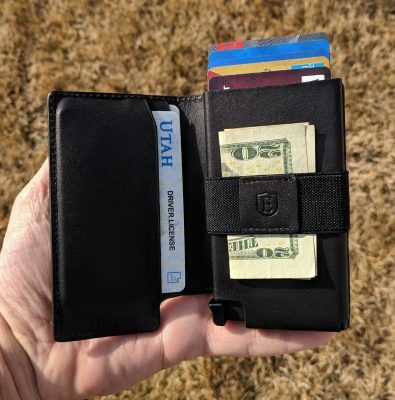 I need all the help I can get at this point. So I went with the F8 and that’s what this review is based on. First off one can’t help noticing the amazing looking face on the F8. 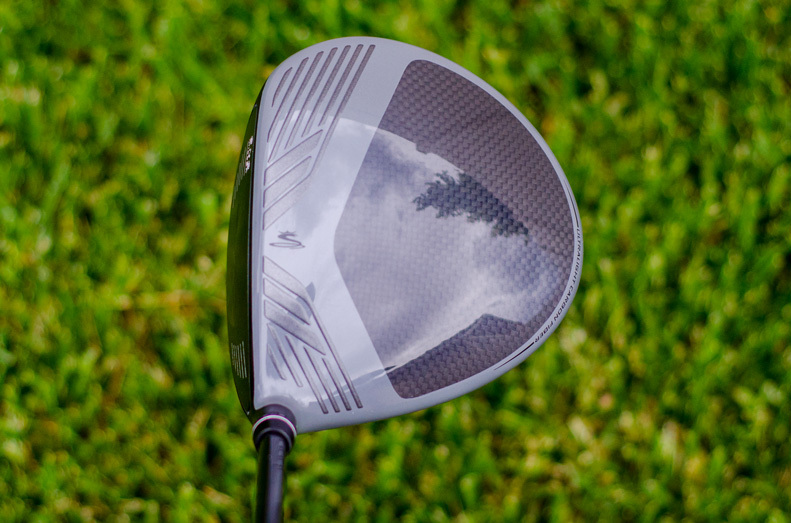 It is milled with hundreds of tiny grooves, unlike any other driver face out there (image above). The CNC milling of the F8 series insures precise thickness in the face, reducing inconsistencies found in other drivers. The helps produce consistent ball speeds on off-center shots. 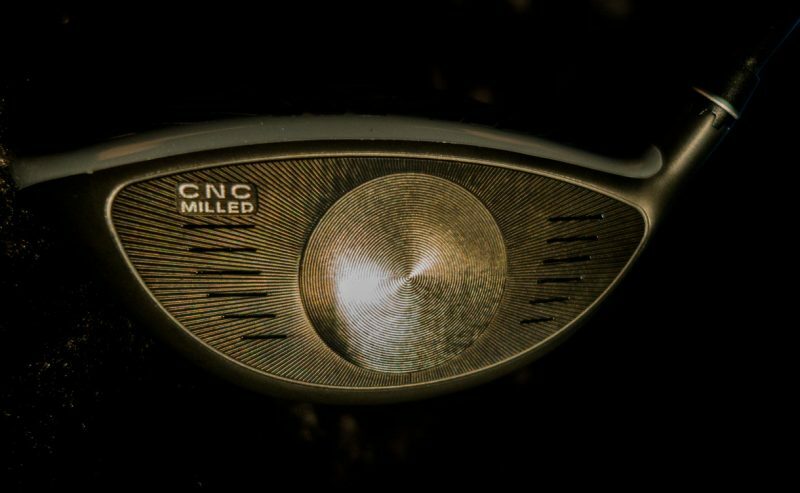 The milling also helps the player control the ball better with a better grip, and a place for the driver to move moisture away from direct contact with the ball. The face has different curvatures at the top and bottom. 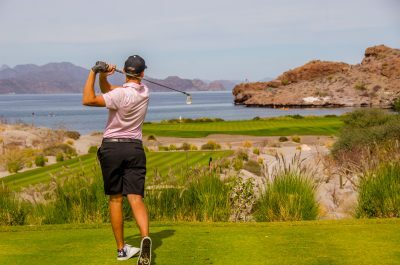 This “Dual Roll” technology helps expand the sweet spot vertically above and below center, optimizing launch and spin on shots high or low on the face. The top (crown) of the F8 features an ultra-light carbon fiber section (photo below). This allows the top of the club to be very light, and help move the COG (center of gravity) lower, which is good. Lower COG helps ball launch higher and with less side-spin. The “MyFly” adjustable hosel on the Cobra F8 offers numerous settings in terms of loft and lie. There are neutral settings and draw settings for most of the lofts, except the 12 degree only comes in neutral only. There are two moveable weights on the F8, as with the F8+. The F8’s weights come in 2 gram and 12 grams. They can be placed near the hosel and near the back of the club. This differs from the F8+, which has spots for the weights behind the center of the face, and in the back center. The shaft I chose for my model is the Mitsubishi Chemical Tensei CK Blue 50. 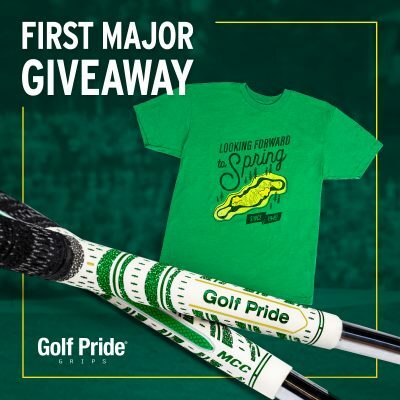 It’s an ultra-light shaft which helps me launch it higher, since I’m a low ball hitter. 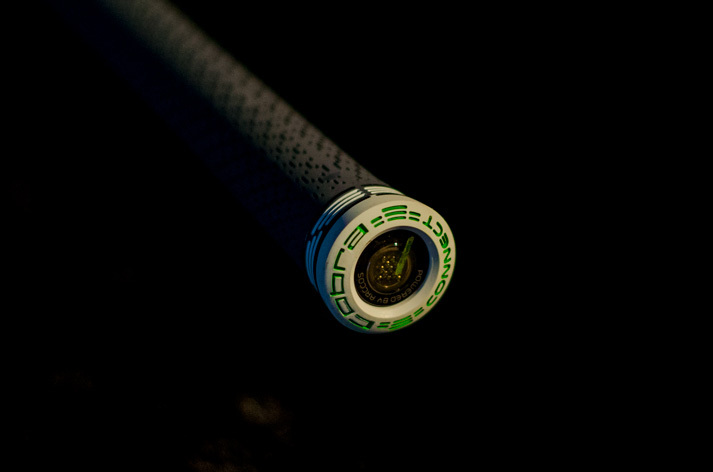 It’s a stiff shaft, even though the Cobra website says this shaft is only available in Regular and Lite flex. Other shaft options available include: Aldila NV 2KKV Blue 60, Aldila NVv 2KKV Green 65, Project X HZRDUS Yellow 75. The F8 comes with a nice, durable and sharp looking head cover. 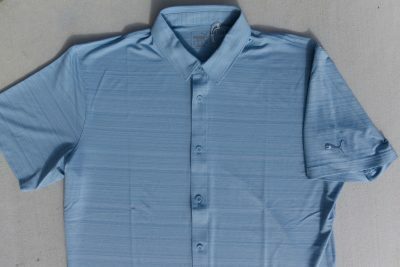 Putting it on and taking it off is easy and it protects the driver well. 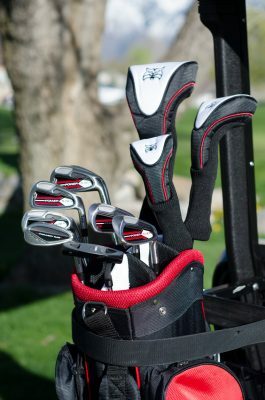 The adjusting tool is solid, and clicks when the club is tightened enough to prevent stripping or damaging the head by applying too much pressure. The end of the grip contains the “Cobra Connect” sensor. 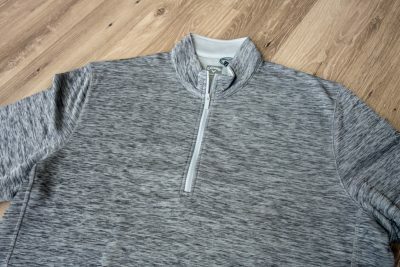 This sensor, when used with the Cobra Connect app allows golfers to track driving statistics like distance and accuracy. The app can even make recommendations on driver settings by analyzing the user data. The F8 comes in two colors: Black and Nardo (gray theme). The driver pictured here is Nardo. 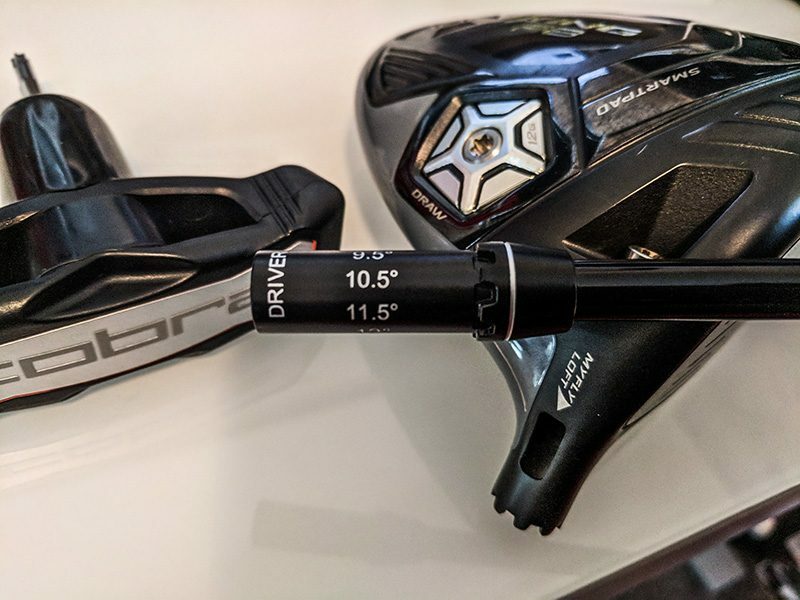 The first thing I do when I start testing an adjustable driver is take it to the range and hit a few shots in the default settings. 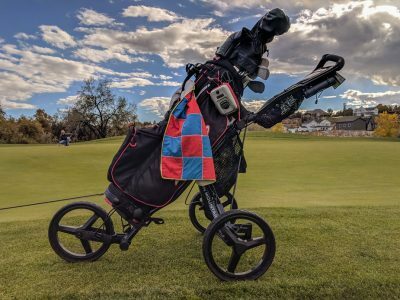 In this case the settings were 10.5 degrees and a draw bias, with the 12 gram weight in the back of the head and the 2gram weight by the hosel. I hit it fairly well with that setting, but found I was not controlling the side spin as well as I wanted. I was hitting some right shots and fades. From there I went through every possible setting, such as nine degrees loft, neutral face angle, and the weights in both positions. I found little difference in shot difficulty when changing lofts. The club was still easy to hit, even in the nine degree settings. The 12 degree setting was easy too, and it seemed to launch the ball just a tiny bit higher. The key for me was the weights. On nearly every loft/lie setting I found the feel and direction of the shots were all better with the 12 gram weight by the hosel and the two gram at the back. When the heavier weight was in the back I saw a little ballooning in the trajectory. With the 12 by the hosel the ballooning went away and the fades straightened out to straight balls. The setting I finally settled on, and still use after months, is 10.5 degree draw with the heavier weight by the hosel. For my swing, combined with the Tensei shaft, I’m very accurate and long for me. I’m not a bomber, but longer than average. I’ve gamed the F8 in most imaginable conditions: damp, rain, hard, fast, windy, cold, hot. Had a lot of fun with the F8 in 30-40mph winds at Bandon Dunes recently. On one hole into the wind I crushed it 148 yards! Later with the wind on I hit one 385 yards and nearly drove a 400 yard par-4 on Pacific Dunes. I like going driver-putter-putter-putter for par on par-4s. My fairway percentage has been up around 80%. During a solid round earlier today I hit a blistering 13/14 fairways for 93%. That will work. The Cobra F8 is a fantastic and easy to hit driver. The F8 offers a massive number of features and settings which will help golfers of all ability levels dial in the best launch conditions for their game.